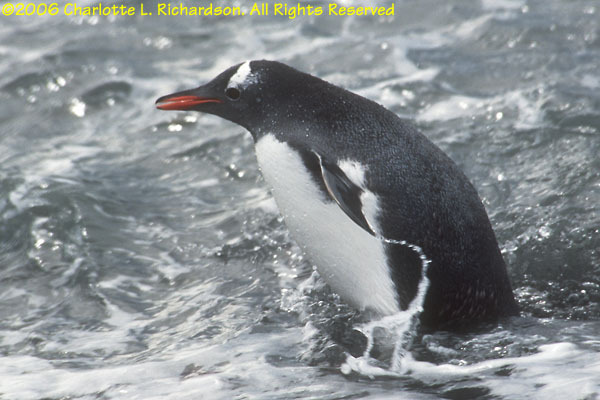 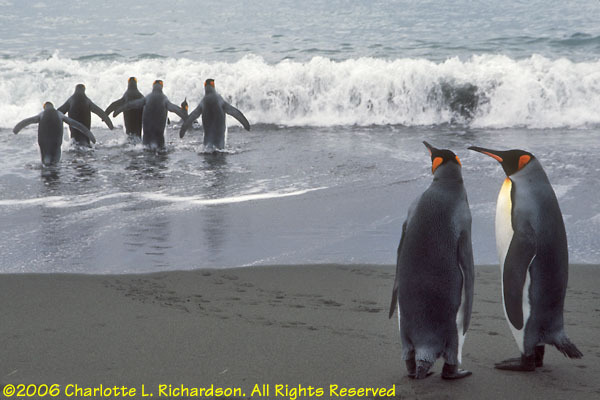 South Georgia is the best wildlife viewing site in the Southern Ocean! 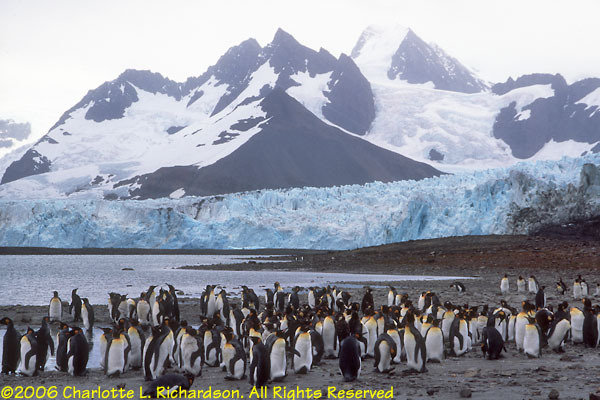 The rugged main island is 102 miles long, 24 miles wide, and has more than 160 glaciers. 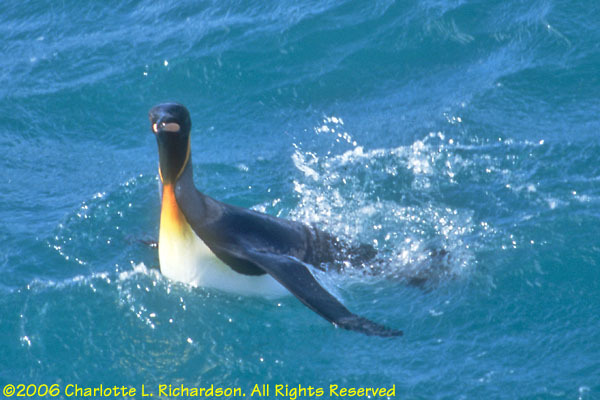 It is about 800 miles east of the Falklands, about 3 days' sailing time. 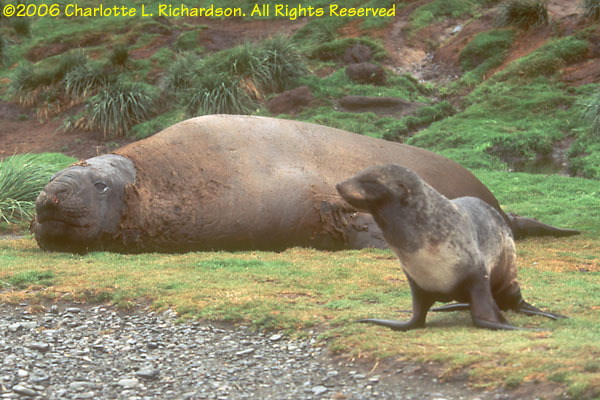 The southwest coast faces the prevailing winds and is cold, cloudy, and windy all year round. 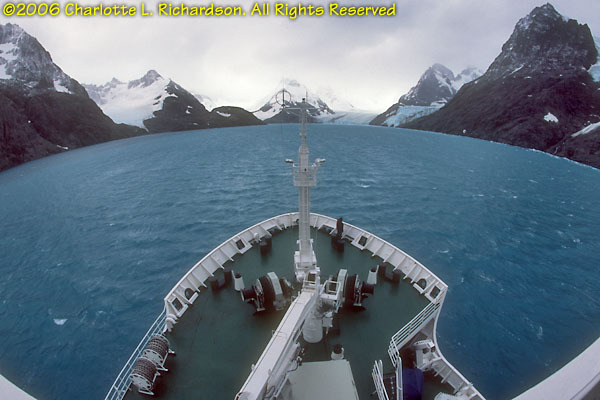 The northeast side is protected by the mountains of the Allardyce Range, and has several bays for safe anchorage. 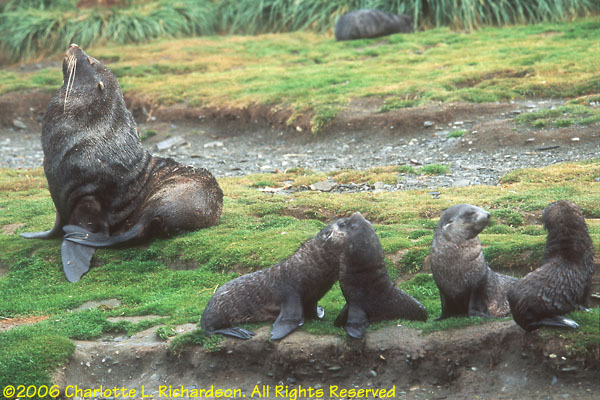 Seven whaling stations were established on the leeward side, Grytviken being the first. 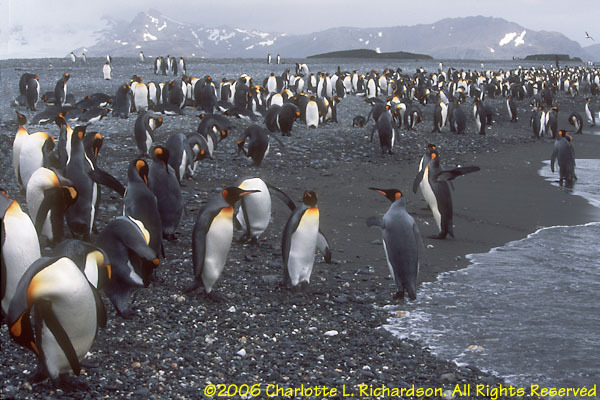 This glacial plain is amazing, a huge king penguin colony! 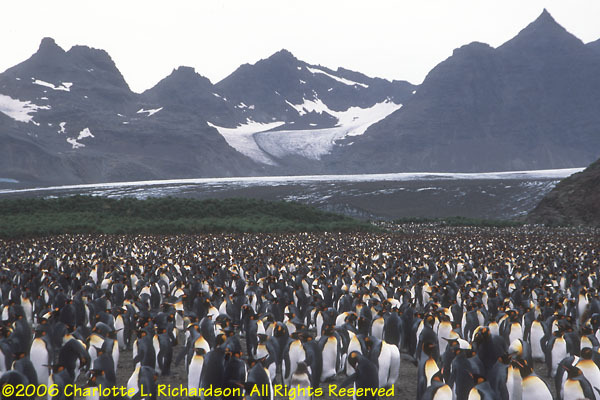 A hundred thousand pairs of adult birds, with eggs, new chicks, and older chicks make this a fantastic place. 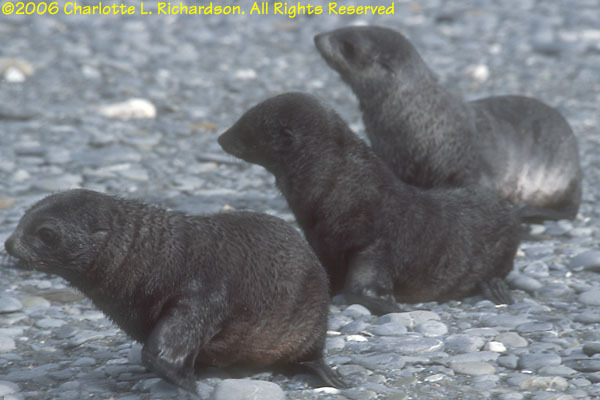 There are fur seals here as well. 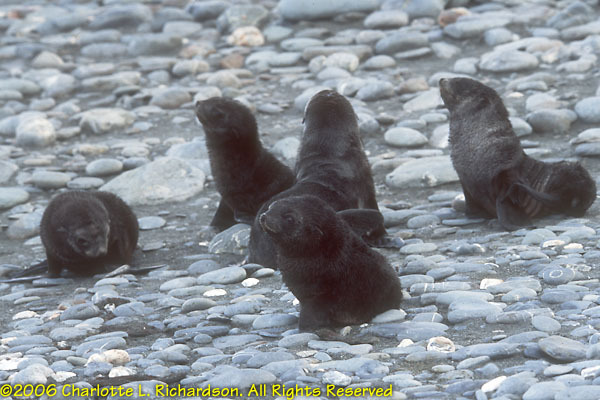 And where there are penguins, there are skuas. 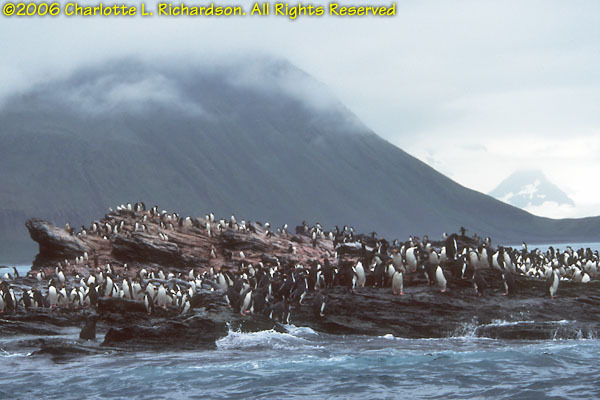 The plain faces due north on the Bay of Isles and is backed by the Grace and Lucas Glaciers. 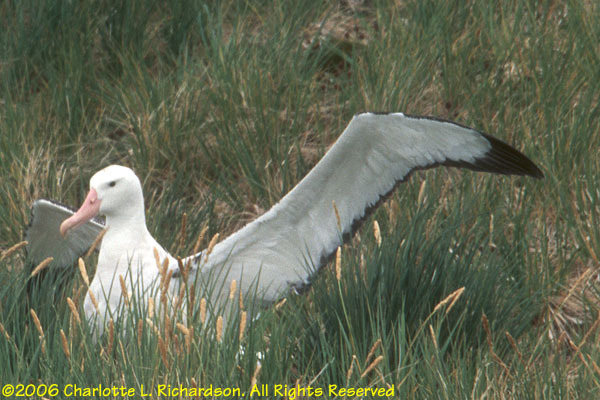 Prion Island, in the Bay of Isles, is home to a wandering albatross breeding colony reached by a nasty slog up a muddy meltwater stream. 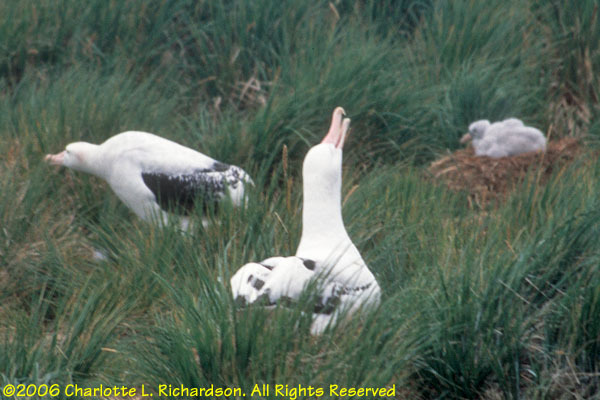 Nearby Albatross Island, due north of Salisbury Plain, has a much larger colony, but is off-limits to visitors. 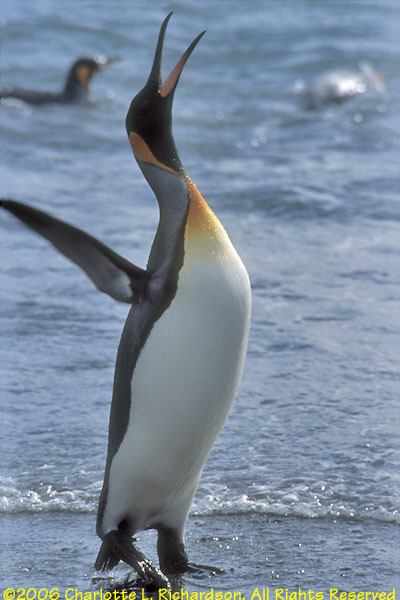 The bird have a twelve-foot wingspan and are very awkward on land. 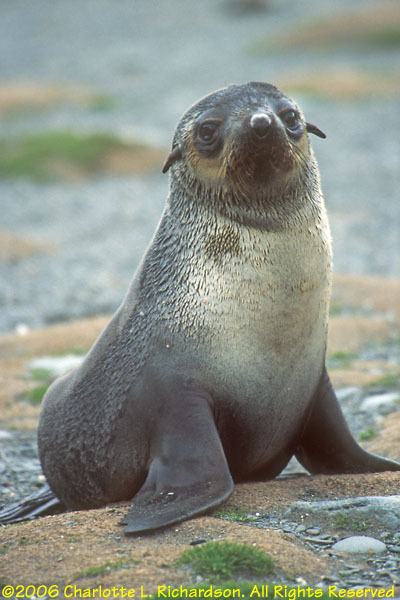 Royal Bay faces due east. 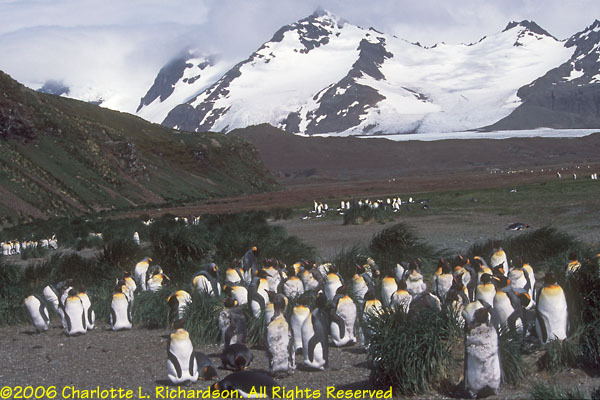 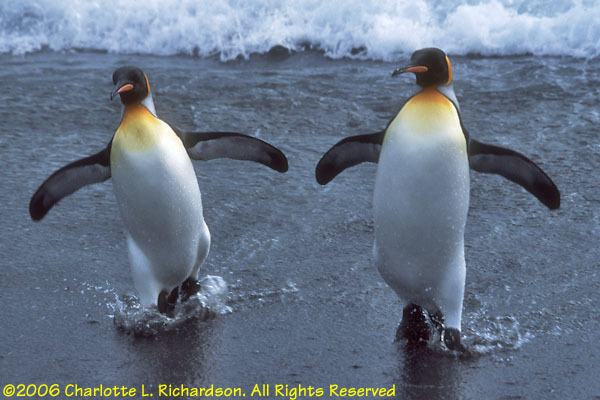 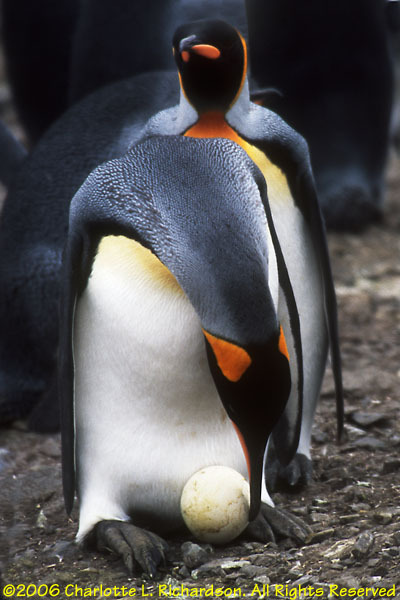 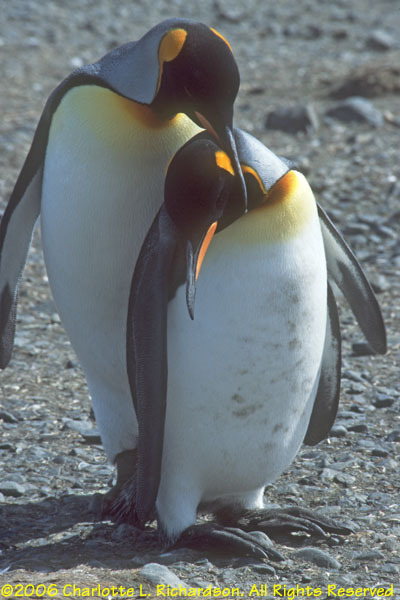 The king penguin colony here has a tidewater glacier, the Ross Glacier, behind it. 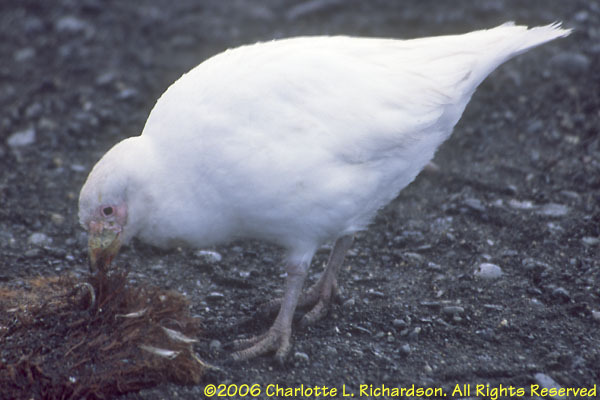 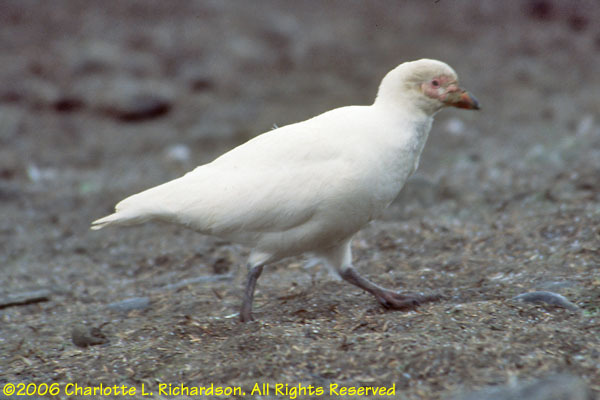 Snowy sheathbills are scavenger birds that will eat nearly anything. 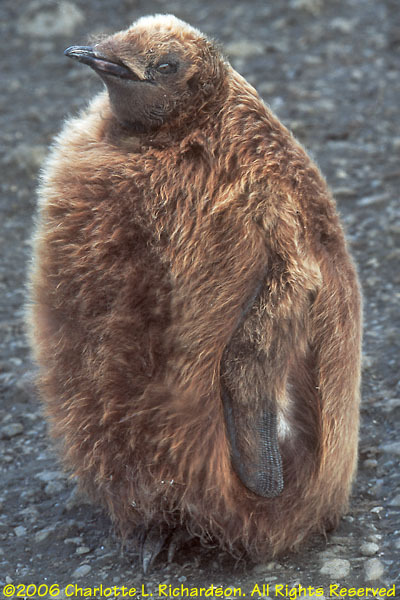 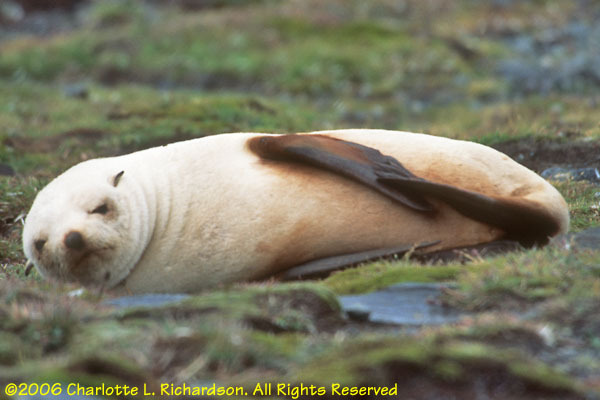 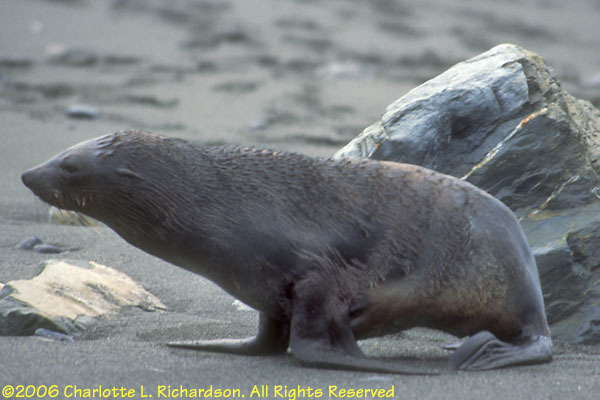 A few fur seals are blond, like this female. 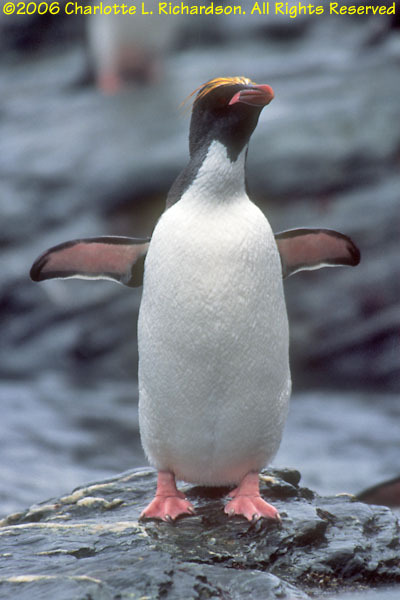 The weather was too poor to make a landing here. 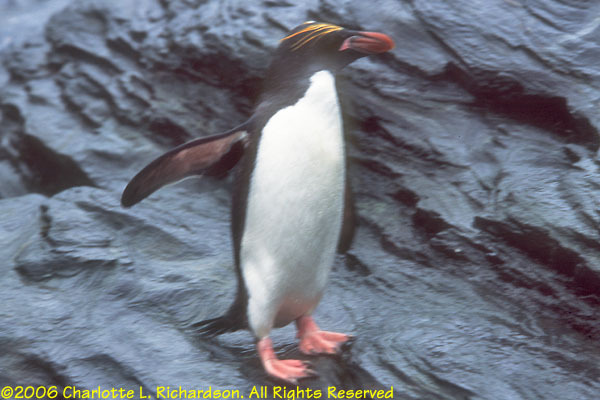 Macaroni penguins resemble rockhopper penguins, and nest on very steep terrain. 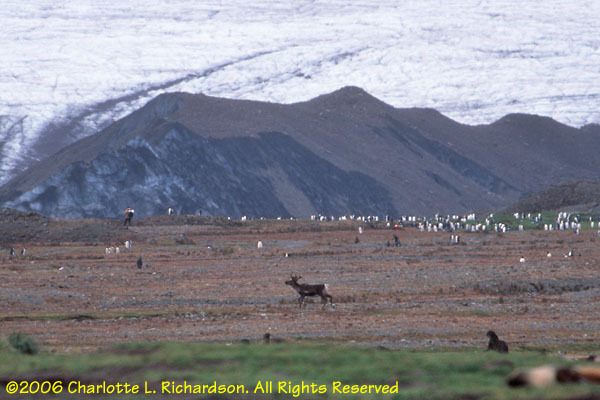 Fortuna Bay is one of the sites where reindeer were introduced to provide sport for the whalers stationed on South Georgia. 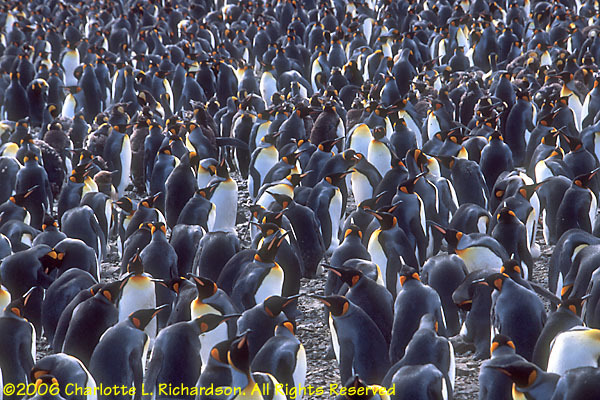 The animals number a few thousand now. 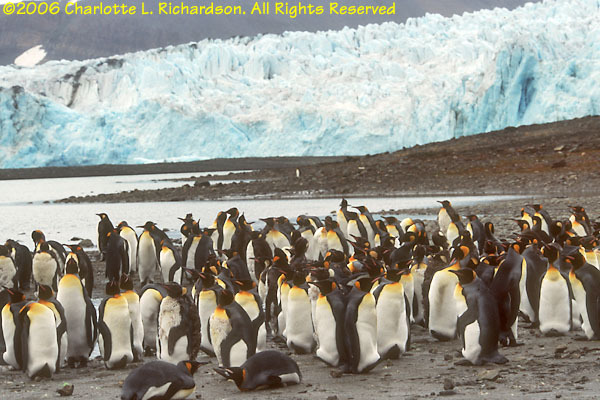 Luckily, they cannot cross the glaciers and so are restricted to the areas where they were originally introduced. 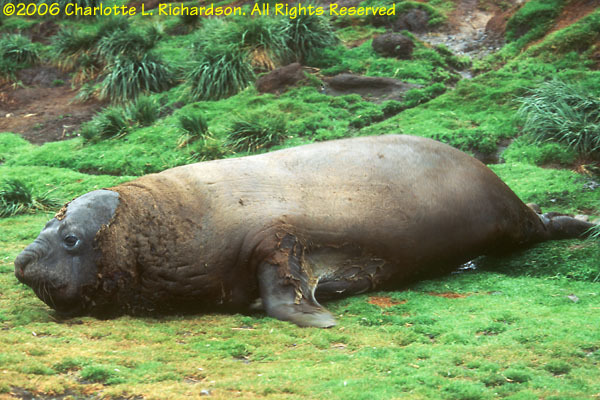 They eat the slow-growing mosses and other vegetation. 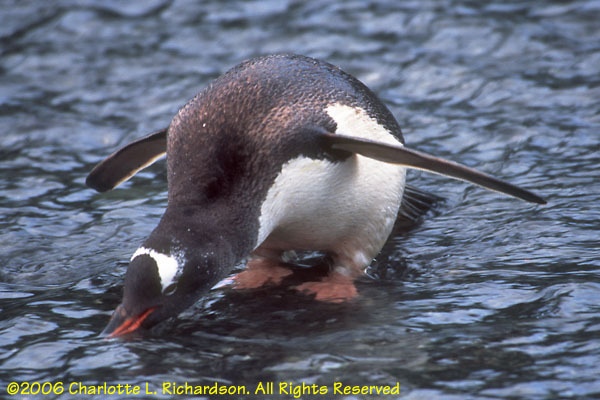 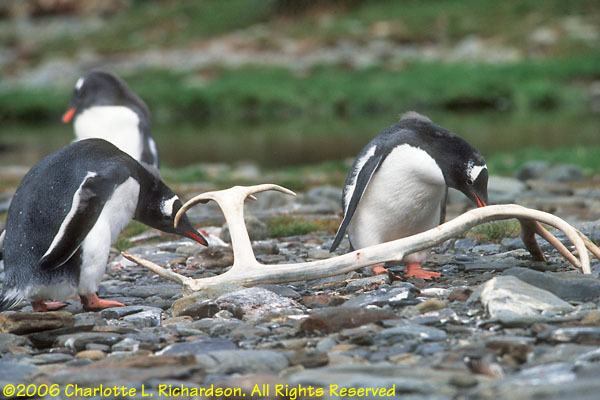 The gentoo penguins do not seem to know what to make of the cast antlers on the beach. 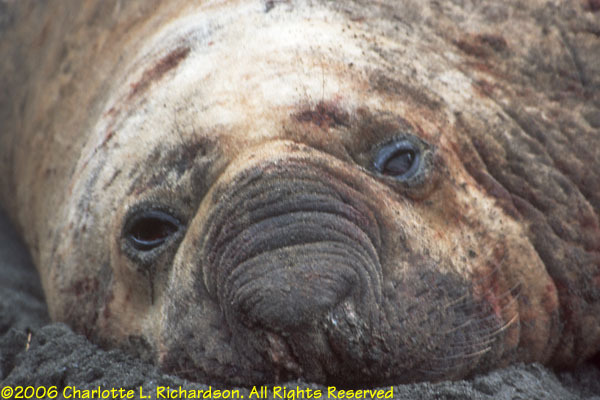 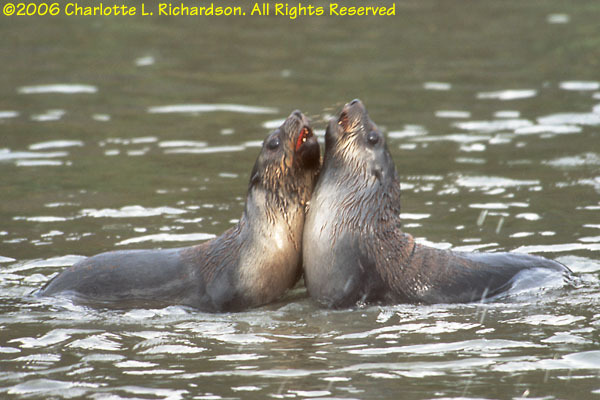 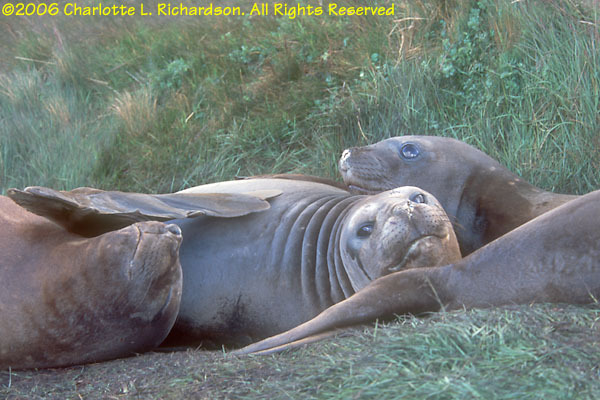 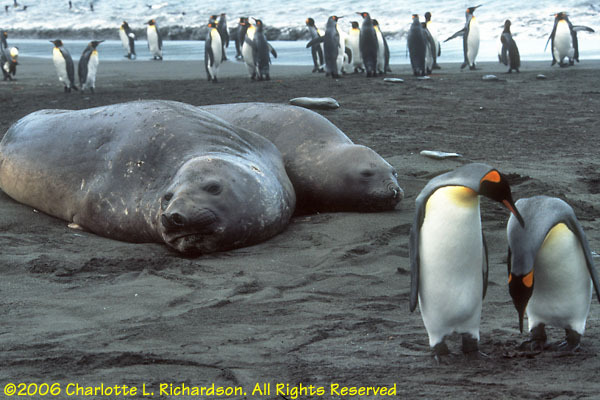 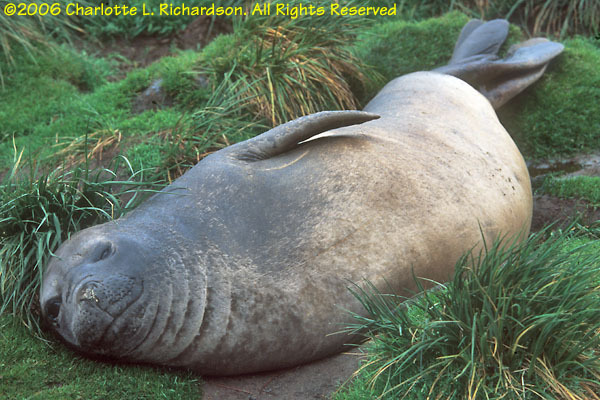 Both pugnacious fur seals and sleepy southern elephant seals are common at Fortuna Bay. 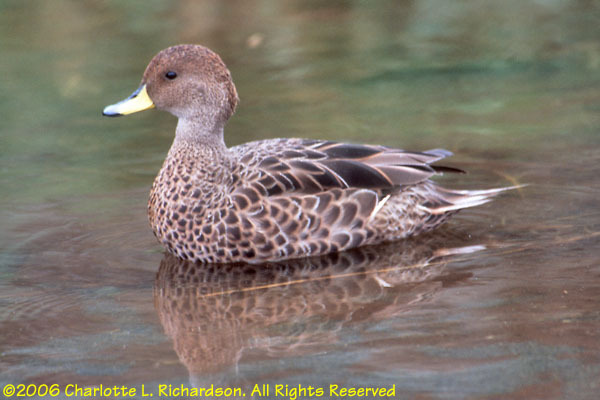 The South Georgia pintail duck is the only carnivorous duck. 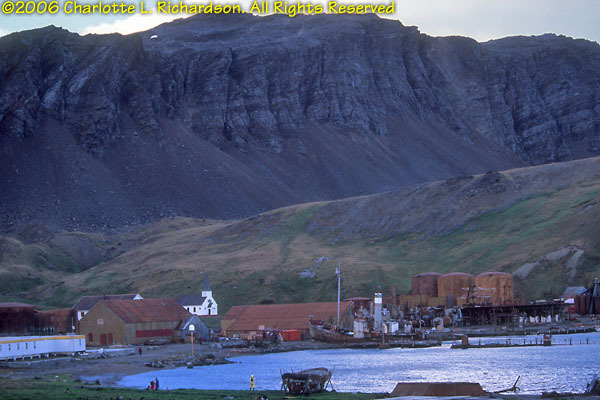 The old whaling base at Grytviken has mostly been torn down because the loose sheet metal pieces of the buildings were very hazardous in the high winds. 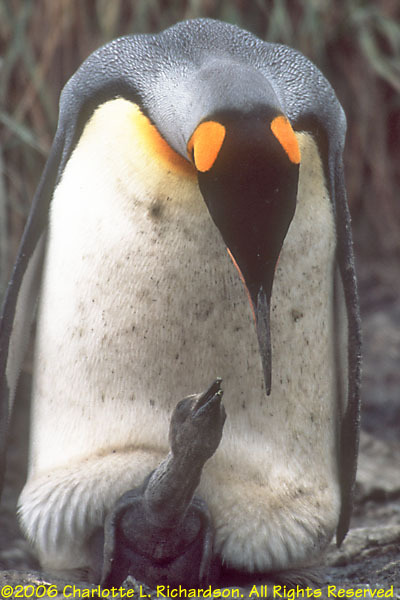 So it is not as interesting as it once was. 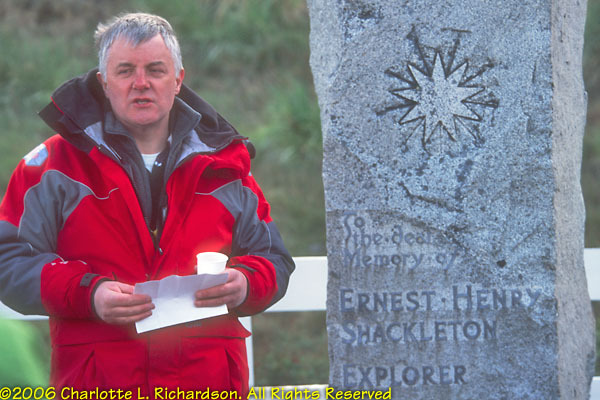 The main reason to visit now is to offer the traditional toast at Shackleton's grave site in the whaler's cemetery. 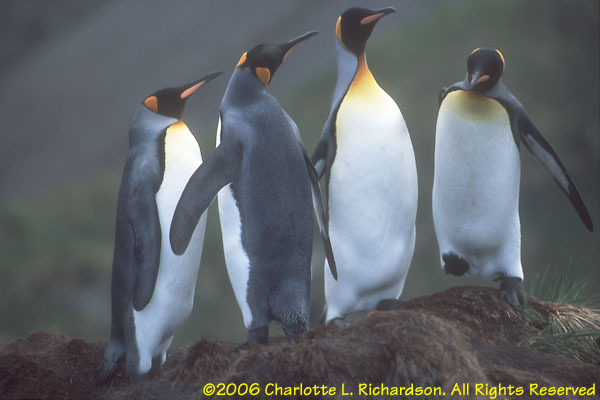 There is a huge king penguin here below the glacier. 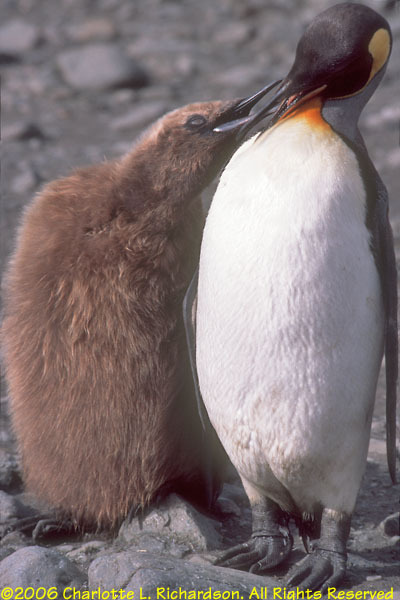 You can see the brown color of countless king chicks from the offshore anchorage. 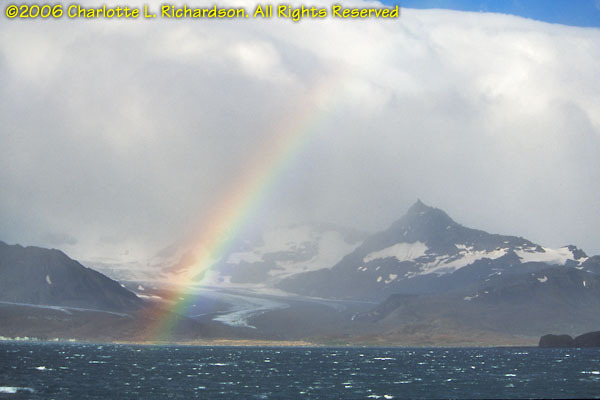 We were not able to land here due to the very strong katabatic winds roaring down off that glacier. 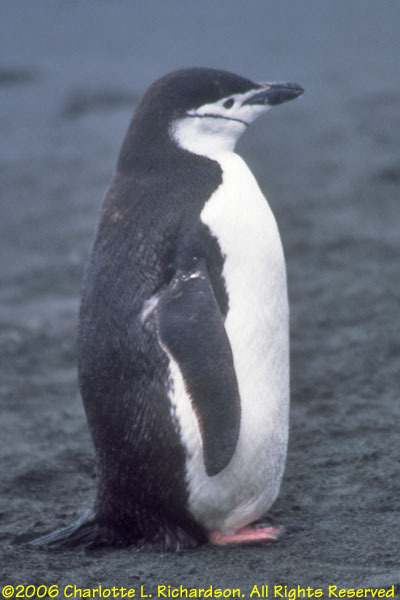 Those winds occur when super-chilled air over the ice cap is disturbed and flows down the glaciers to the sea, and can rise in a matter of minutes to gale force. 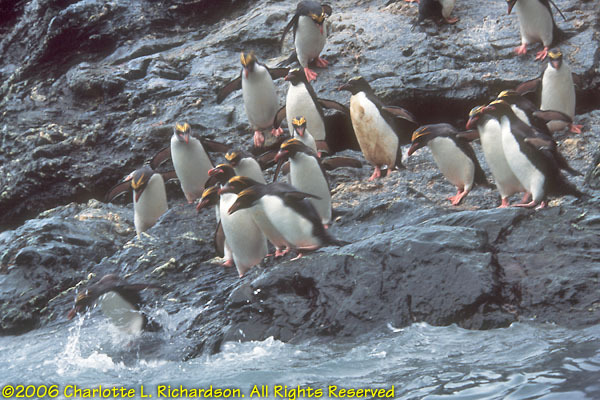 The strong winds kicked up so much salt spray that we had a beautiful rainbow over the penguin colony. 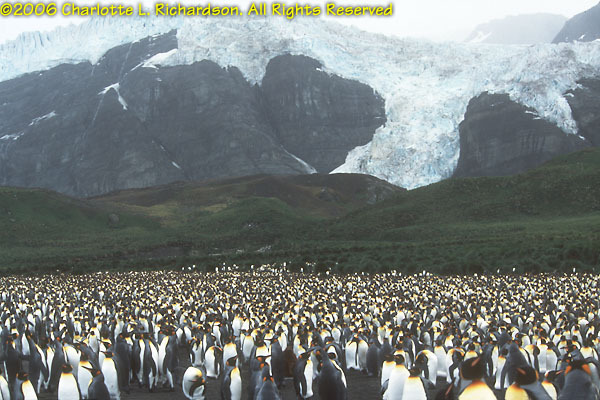 Gold Harbor is just south of Royal Bay. 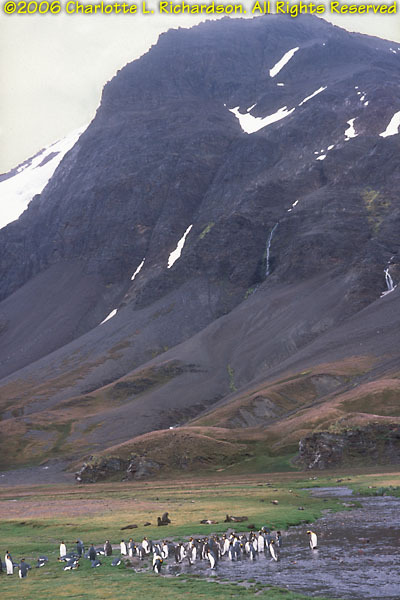 The Bertrab Glacier forms the backdrop. 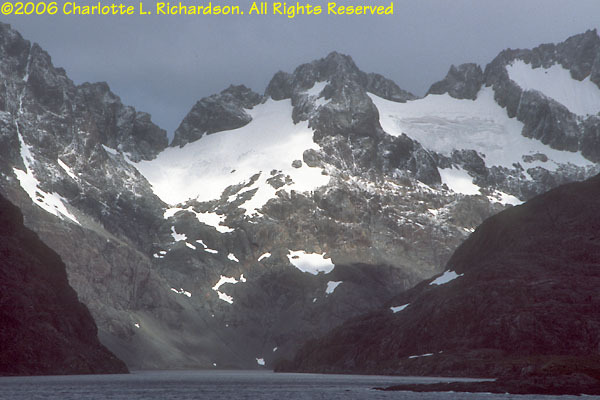 This beautiful fjord penetrates the southeastern tip of South Georgia.